Over the years the hunting industry has changed considerably, in some cases for the better and others for the worse. The introduction of species to areas that are not at all suited to them was solved by nature. Sometimes the new habitat has agreed with introduced specie, and they have flourished. In many cases, however, they have become a pest or varmint like the antlered species in the Cape region of South Africa, or the many problem species in Australia. My personal feeling is that if certain species were supposed to be in these areas, they would occur naturally. The moment mankind starts taking radical decisions regarding the translocation of game, it normally causes a screw-up. 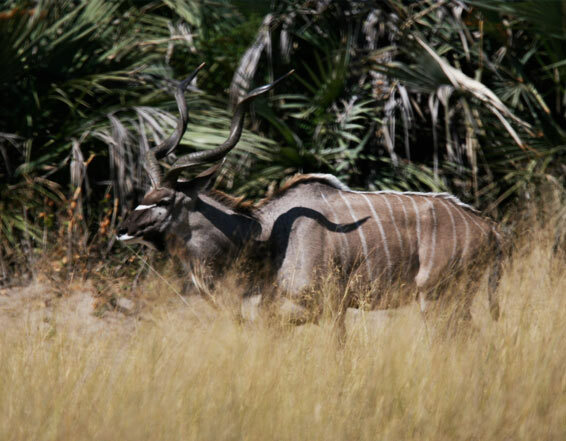 Can you imagine Lord Derby Eland on the Free State plains, Himalayan Tar on the banks of the Zambezi or Red Stag in the Kalahari? I have shuddered at the sight of an Oryx taken in the USA knee deep in snow. In my mind nothing can beat the thrill and challenge of the fair chase and ethical hunting of indigenous species in their natural environment hence this article on the endemic species of Namibia. 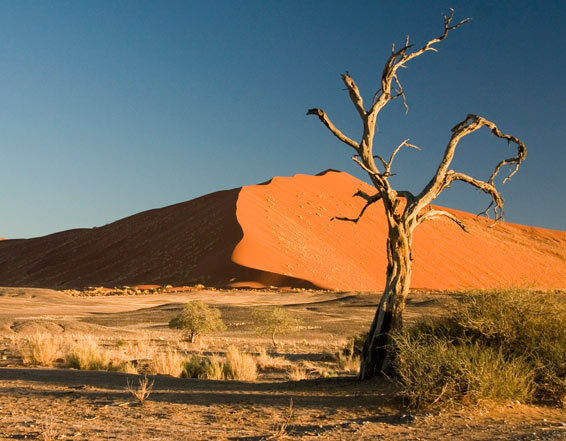 Namibia, a country with vast differences in habitat, is fortunate to have three unique species that are perfectly adapted to the terrain in which they historically occur. The Black-faced Impala or Angola Impala prefer the heavily wooded Mopani forests of southern Angola and northern Namibia. Years ago, the Namibian Ministry of Environment and Tourism, then known as the South West African Department of Nature Conservation, felt it important for this specie to be reintroduced on a number of privately owned properties in Namibia. In some cases they were relocated into areas with the wrong habitat, and needless to say they did not survive. In the Waterberg and northern areas of Namibia, which has dense stands of Terminalia and Mopani forest, they flourished and these areas now have viable herds, which can be hunted as trophies. In some regions they were introduced onto land where Southern Impala were present, and I do not have to spell out the consequences. Owners of Black-faced Impala, on whose property no common Impala were present, were subsequently registered with M.E.T. and are now the only privately owned areas where certified Black-faced Impala can be taken. Herds on all other properties are considered Common Impala. Trophy hunters should therefore be aware of this fact before booking a safari to hunt this rare and rather expensive specie. With it distinct black blaze, (not brown which is often a result of inbreeding with the Common Impala) extending from the nostril to the top of the head and between the ears, and with a slightly larger trophy by quite a few inches, this antelope is an exceptional trophy. They are also overall darker than the common specie in a duller brown with a distinct purplish-black sheen. The facial markings under the eyes are also different with a dark stripe from the nostril to just in front of the eye, which continues on the top of the head, and they also have white patches in front of the eyes. The ear tips are extensively black and their tails are much longer and bushier than their cousin. 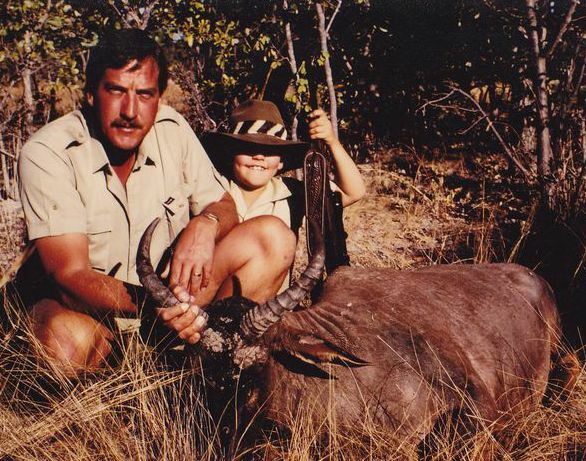 The Black-faced Impala is classed as a normal trophy animal in Namibia, but American Fish and Wildlife dictates that it still may not be imported into the U.S.A. It may, however, be exported to all other countries. Another endemic specie, breeding herds of which have unfortunately been “exported” to neighboring countries, is the Mountain Zebra or Hartmann’s Mountain Zebra. As this magnificent animal is classified as C.I.T.E.S. 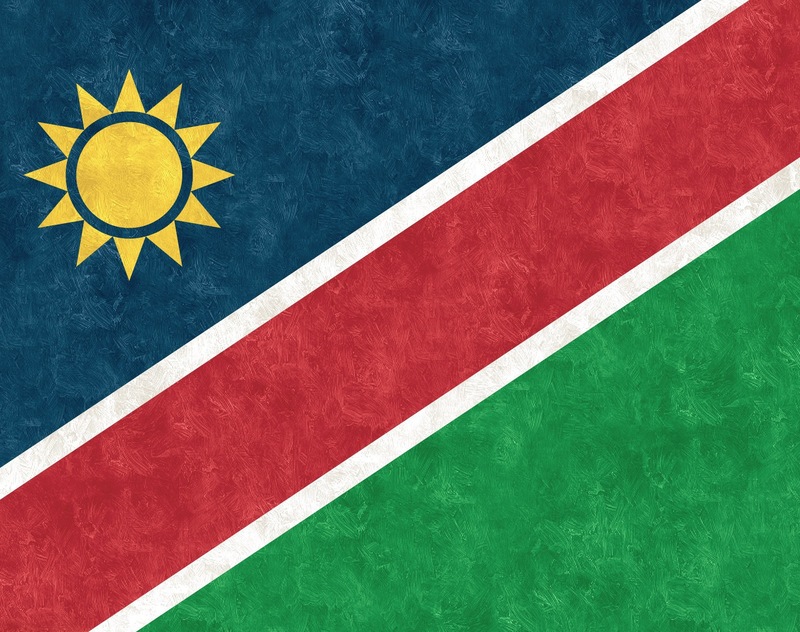 Class II, trophy hunters must be very careful where they are hunted as only trophy animals taken in Namibia may be exported. A very tough animal, which primarily lives in the western and mountainous semi desert areas of Namibia, where it must survive under conditions of sparse grazing and limited water sources. Mountain Zebra are capable of trotting straight up a mountain slope for several kilometers without stopping, slipping or hesitating, and are guarded by their eagle sharp eyes and very sensitive and acute hearing. Each animal has exactly the same skin markings, of which the herringbone triangular pattern above the tail is the most distinct. The lack of “shadow” stripes, which are found with Burchell’s zebra, as well as the narrower white stripes makes this specie appears black when spotted at long range. They also have large donkey like ears, ginger red facial markings instead of black, and a distinct dewlap under the throat, a white belly as well as stripes all the way down to the hoof. The hoof itself is oblong instead of round to give it more purchase in the rocks, and is angled at 45° towards the fetlock or back part of the hoof. Family structure is interesting as the dominant mare is always in the lead when fleeing, with the stallion is always at the back. It is not always a good idea to shoot the herd stallion as the dominant mare quite often fights off new breeding stallions, and a herd sometimes will not produce young for longer periods. 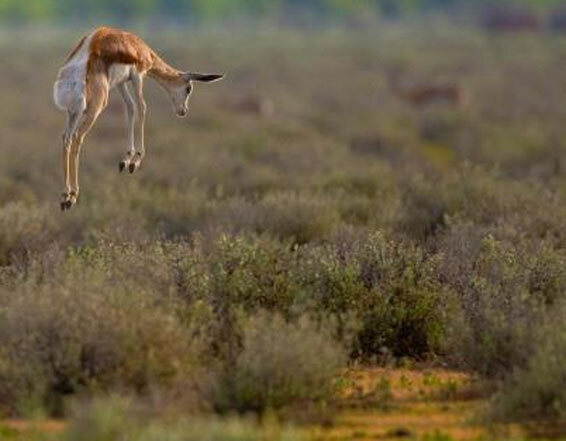 The pigmy antelope unique to Namibia, the Damara Dik-Dik, also known in Afrikaans as the “Blue buck” (translated) is named for their sharp, rapidly uttered alarm-whistling call as they escape after being disturbed. This specie is found primarily along the western rock strewn, dense brush overgrown, grassless, hard clay ground edges of the mountainous regions in the deep south of Namibia up and into southern Angola. Unlike the Klipspringer, the Damara Dik-Dik does not jump from rock to rock but prefer the flatter areas, avoiding rocky outcrops. They are found singly or in pairs in their marked territory and spend the biggest part of the day ruminating. To hunt Dik-Dik you have to stalk the thickets at first and last light and your chance of spotting him first is very slim. When flushed they disappear like a ghost in the mist into the undergrowth after sending the alarm whistle vibrating through their nostrils. A tiny 5 kg., animal half the size of a Steenbuck, can present you with a challenge as his coloring blends in exactly with the stems of the undergrowth in which he lives. The upper parts of the body are grizzled yellow-gray with parts of the head and flanks and side of the neck a pale rusty color while the belly, chest and thighs are pure white. Even the little rounded forehead does not give him away amongst the bent stems of his domain. (When excited a fringe of hair is erected between the ears, and even if you have spotted it first, makes it impossible to see their tiny horns.) A formidable and challenging little trophy endemic to Namibia.